With the unforgettable events of the Quickening behind them and the Ascension Year underway, all bets are off. Katharine, once the weak and feeble sister, is stronger than ever before. Arsinoe, after discovering the truth about her powers, must figure out how to make her secret talent work in her favour without anyone finding out. And Mirabella, once thought to be the strongest sister of all and the certain Queen Crowned, faces attacks like never before – ones that put those around her in danger that she can’t seem to prevent. 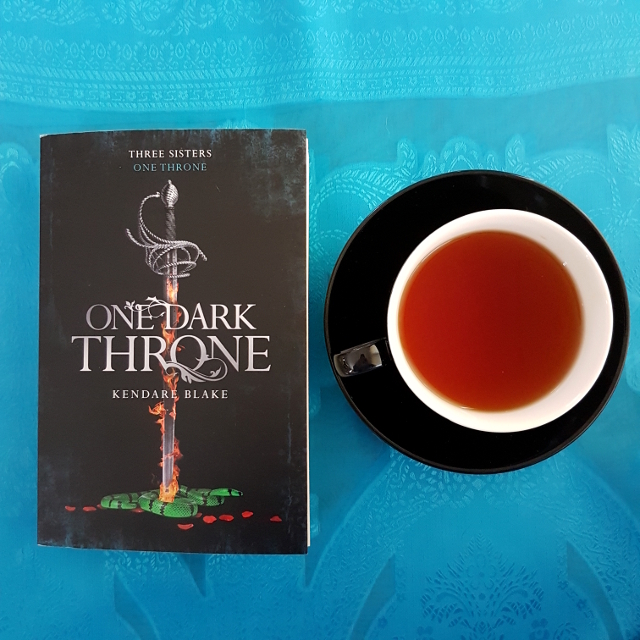 One Dark Throne is a dark fantasy YA novel that had an interesting premise but does disappointingly little with it. The story probably won’t make much sense to those who haven’t read the first book. There is a little jump ahead in time (though not by much) and not much in the way of recap for new readers. It’s quite a plot-heavy book, choosing to focus on events rather than characters or world-building. The style is cinematic, with some spectacular scenes as the queens battle it out for supremacy. There’s also a somewhat Gothic vibe, both in terms of the aesthetics and events. It’s toned down from the previous book, which focuses a bit more on the poisoners in their home territory. However, it remains present, particularly in the doomed love elements. The story is told in close third person, alternating between each of the political camps. This allows the reader to find out what’s going on around each of the queens, but it also slows the pace of the story. Some of this word count could have been trimmed back a bit or put towards adequately foreshadowing some of the later twists and turns. One of the things I liked about the book was its approach to romance. Each queen has quite a different story–with one telling of mutual (though untraditional) love and the other two telling of unrequited love (both for the queen and by the queen). These romantic elements are fairly low-key and are counterbalanced by friendships which are just as varied: Katharine has become a solitary queen without people she really depends on, while Mirabella and Arsinoe have close friends they count on in quite different ways. Unfortunately, the book is let down in other ways. The premise of the story–that three sister-queens must battle to the death to win the throne–requires quite a suspension of disbelief from the audience and there’s little to support the reader in doing that. No proper explanation is given, aside from tradition, and it’s never interrogated in any significant way. There are hints those things may happen in later books, but that’s a long time for readers to be holding that space. The book also lacks a solid theme. There are elements of sibling rivalry and nature vs nurture, but they fail to cohere in any satisfying way and rather left me wondering what the story was trying to say. I kept hoping it would come together later into the story, but after two books, my patience has grown thin. I also had an issue with the way the story equated insanity with violence. This crops up a number of times, particularly in relation to the war gift and those with more than one gift, as well as in relation to Katharine’s thread. Granted, it is a violent story, but this approach lacks nuance and compassion to those with mental health issues. All in all, One Dark Throne was not the book for me. Oh dear, this is v. disappointing across the board, but particularly the thing about equating mental illness with violence. Any time I send emails to podcasters or newspaper persons or cultural commentators, it’s because they’ve made the same mistake. I feel like a broken record skipping back and back and back to the same stupid thing, and I just wish people could get it through their heads that those two things are not the same. Blah. I find there’s also often a circular logic to it, too. They’re violent because they’re mentally ill and mentally ill because they’re violent. It’s pretty frustrating.